Anoseknows.com : Potatoes, Cilantro, Onions and Brown Mustard Seeds! Hello, and Welcome to www.anoseknows.com Explore our blog and find inspiration for a more productive, happier life for yourself through fitness and mind-body connections. Thank you for being here! 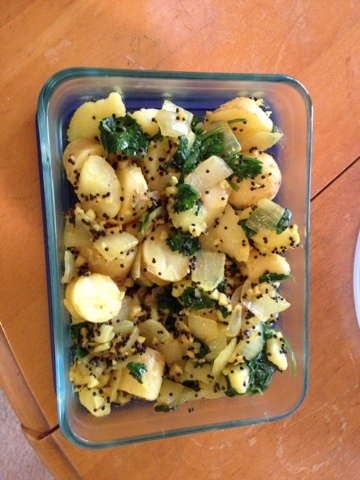 Potatoes, Cilantro, Onions and Brown Mustard Seeds! Such a delicious dish! I made it last week for one of my clients, who loves to eat Ayurvedic foods. Cilantro is a great tasting herb that helps eliminate toxic heavy metals in the body, absorbed from pollution or chemicals in the food. Bring water to a boil, pierce potatoes with a fork in a few places, and boil the potatoes for 20-30 min. Let potatoes cool before chopping. Sauté mustard seeds in ghee or oil until they begin to pop. Add the onion, a little salt, and cook until translucent. Now add the boiled potatoes and a pinch more salt. Throw on the cilantro last, and cook briefly until wilted. Great side dish!! Eat good food, live happy & inspire others.